In the lead up to Election 2019, we're presenting politicians with our vision for a kinder world — on city skylines, suburban streets and beyond. We've been waiting for this opportunity for a very long time. For the first time ever, a Federal election will decide the future of the live sheep export trade, with Labor committing to end it, if elected. Since the routine suffering of sheep on live export ships was exposed a year ago, dedicated Animals Australia supporters the world over have lent their voice to animals. 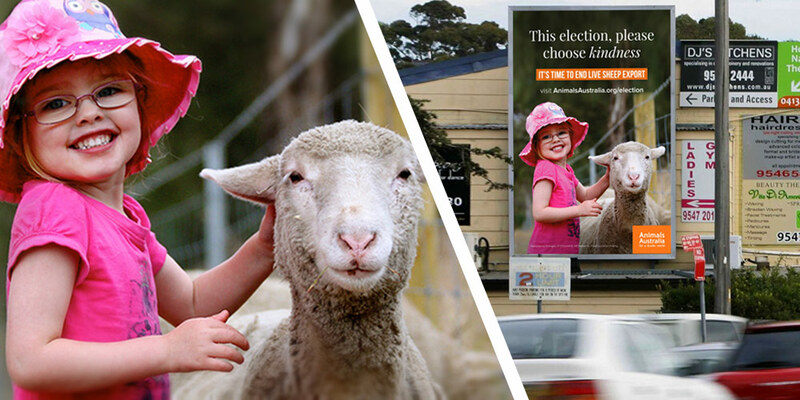 Now, in these crucial weeks leading up to the Federal Election, we're helping amplify this call for compassion — in our brand new ad blitz! 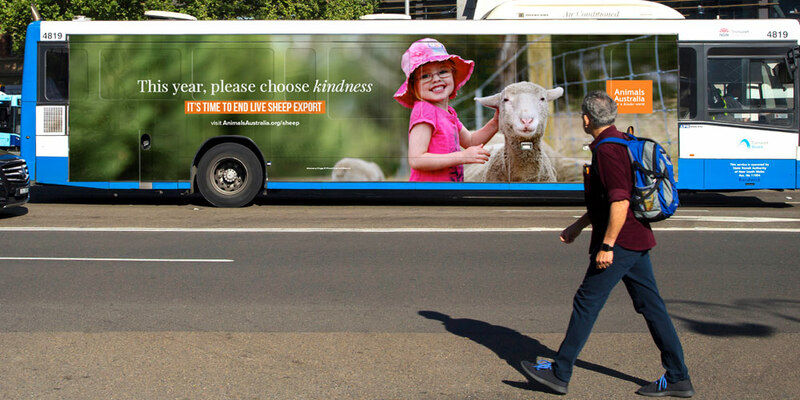 From billboards overlooking some of the country's busiest highways, to taxis that wend and weave their way down suburban streets and country roads; on street signs and buses in the most hotly-contested electorates in the nation — our call to choose kindness this election will be impossible to ignore. 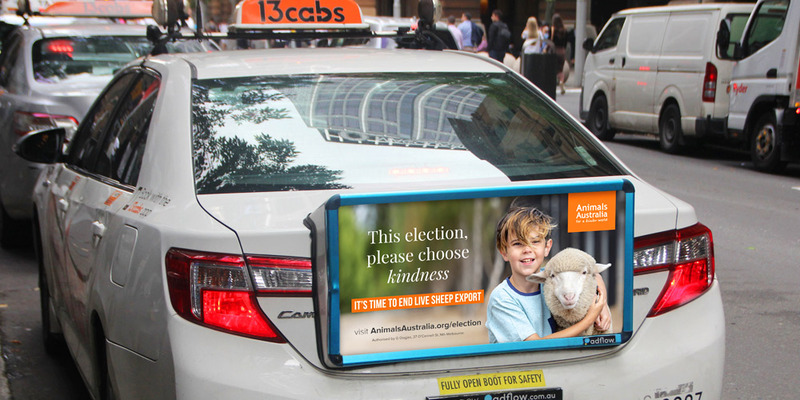 These eye-catching billboards, posters and taxi backs are designed to remind politicians that the vast majority of Australians want an end to the cruelty of live export. And they want decision-makers who have the strength and heart to make that happen. So we thought, who better to communicate this vision of a kinder future for the world — than those who will inherit it? Here's introducing the awesome foursome stars of our new campaign: Darcy, Lexi, Memphis and Isabelle. Memphis has been an active voice for the animals for five years now — that's over half his life! 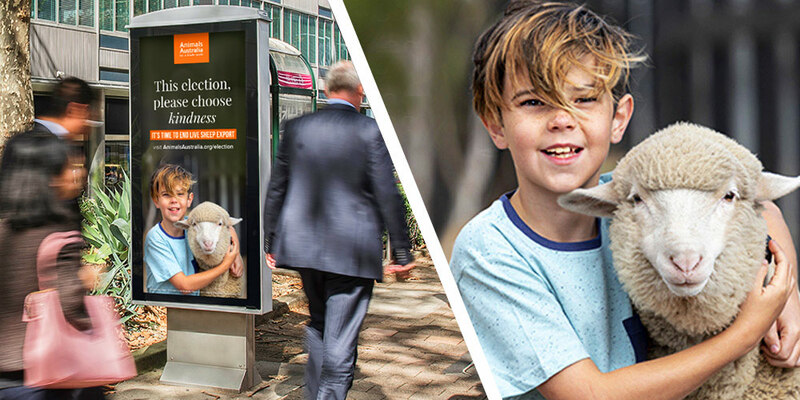 His journey began by begging his mum to take him to an end live export rally in Adelaide — and now he's starring in our campaign with the lovely Lexi, a rescued sheep who is now safe for life at Edgar's Mission Farm Sanctuary. We're tickled pink to have the support of animal-lover Isabelle and her woolly friend Darcy — who was given a second chance at life thanks to Freedom Hill Sanctuary. Rescued as a week-old orphan, Darcy's love of people and having his photo taken beautifully demonstrates how every sheep is an individual — a reality ignored by the live export industry. With political parties out in force pitching to voters their vision for the future, we'll also be spending the next few weeks pitching ours: a world where compassion trumps cruelty, where kindness equals character, and where the vulnerable are protected and cared for. A world free from the cruelty of live sheep export. Click here to check out our guide to where the political parties stand when it comes to saving sheep like Darcy and Lexi from the horror of live export. Authorised by Glenys Oogjes, Animals Australia, 37 O'Connell Street, North Melbourne VIC 3051.